On a snowy Seattle night in late December, “Pushing Daisies” fans braved the icy road warnings and packed into Mars Hill | Lake City to see actor Lee Pace in a film and theology event hosted by James Harleman. The audio examination of the film, which followed a viewing of the movie, has been captured here for those interested. WARNING: contains spoilers. 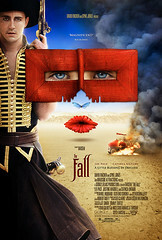 Directed by Tarsem Singh, The Fall is a sumptuous cinematic visual feast, for which we already produced a written review last year by Claudine Miller; if you haven’t seen it, be sure to check out the trailer. This well-reviewed artistic endeavor provides an interesting look at storytelling and escapism, and its resonance with the human heart.